"Builder confidence in the market for newly built, single-family homes gained one point in June from a slightly revised level in the previous month to rest at 29 on the National Association of Home Builders/Wells Fargo Housing Market Index (HMI). This is the highest level the index has attained since May of 2007 (see top chart above). “This month’s modest uptick in builder confidence comes on the heels of a four-point gain in May and is reflective of the continued, gradual improvement we are seeing in many individual housing markets as more buyers decide to take advantage of today’s low prices and interest rates,” said Barry Rutenberg, chairman of the National Association of Home Builders (NAHB) and a home builder from Gainesville, Fla."
MP: The top chart above shows the historical relationship between the NAHB/Wells Fargo HMI (blue line, through June) and the number of new, single-family housing starts (red line, through April) back to 1985. Although builder confidence is still far below pre-recession levels, it has been on a definite upward trend since the index dropped to an all-time historical low of 8 in January 2009, and has now rebounded this month to a five-year high. However, the HMI has to rise above 50 before more home builders view conditions as good than poor, so the market for new homes obviously still has a long way to go. In another sign that home building is recovering, even if it's at a slow pace, the prices for framing lumber - the wood used for new home construction - have been rising (see bottom chart above, data here). Weekly lumber prices have increased by about $100 per 1,000 board feet since last winter, rising from $252 in early November to above $340 in each of the last four weeks. Except for an artificial run-up in lumber prices in April 2010 that was related to the home-buyer tax credit that expired in May 2010, lumber prices in recent weeks have returned to the highest levels since the spring of 2006. The rising lumber prices to six-year highs is possibly reflecting increased demand in recent months for new home-building and other construction projects. Anecdotally, I just heard about a cabin owner in northern Minnesota whose property is located 100 miles from the North Dakota border, and the person is getting bids for a new garage. The local builders said that lumber is hard to get, and also very expensive, partly because of the building boom going on in North Dakota. So there are some hopeful signs of a real estate recovery, and we'll find out more on Thursday when the National Association of Realtors reports on existing-home sales for May. OT-but I can't seem to send a e-mail to Dr. Perry direct. That’s 22 million cubic feet a day, an estimate of 18 billion cubic feet from the well in its primary production. One well, only one, in a shale formation. For investors in natural gas this is a long term, low profit, produce all you can at the lowest possible price – problem. Some folks swirling comments about Chesapeake would have the blame fall on one guy, but the facts are North America has a huge supply of natural gas and its gotten more huge last week. The industry has just been knocked onto its heels; the next big profit period will be years, probably a couple decades away." This shale gas seems to be everywhere. Only low-cost producers will survive. "OT-but I can't seem to send a e-mail to Dr. Perry direct." Did it occur to you that he may not want to hear from you? 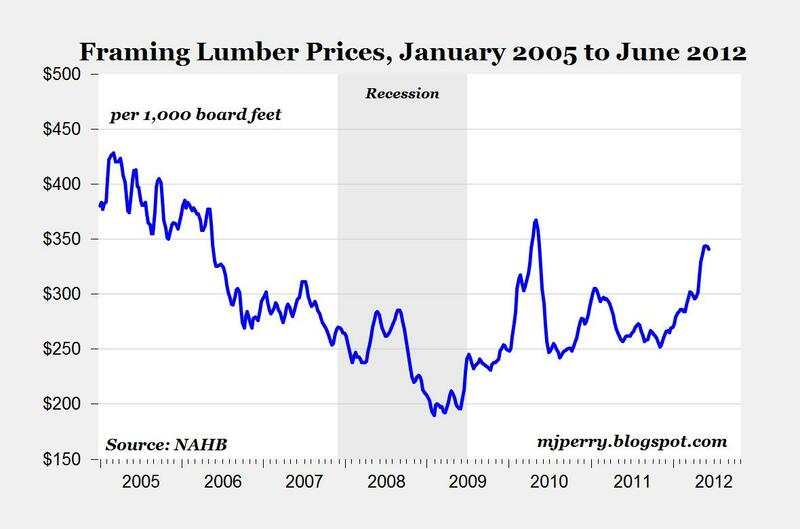 I've been watching lumber prices for well over a year now, and it's become one of my favorite economic indicators. The past couple weeks I've become *slightly* worried it's pulling back from its seasonal high a tad bit earlier than usual, but it may be nothing and it may also be too early to tell. A major reason lumber prices have remained relatively high during the US housing bust is because of the continuing demand from China. The building boom in North Dakota is not a sign of a real estate recovery, it is a sign of an oil & gas discovery in a region where there is no housing. 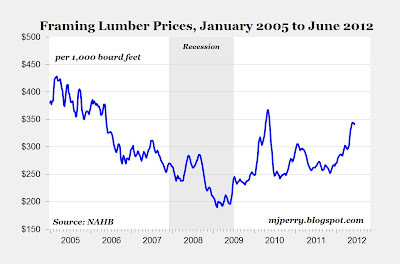 The "improvement" in lumber prices is, indeed, related to the demand in China. However, I believe that the lumber producers are focusing on markets other than the US, because of their lack of confidence in the US housing market. This is also true of other producers, i.e. drywall, windows, doors, etc. The bottom line is that all prices are going to rise, because the increase in housing production will outstrip the production capabilities of the suppliers, leaving the prices to rise like a hot air balloon. And then, there is land. Developed lot supplies, in terms of quality lots, are dwindling fast. All of the class A & B lots are spoken for, and the prices of lots in quality locations are rising quickly. These issues, combined with significant headwinds in the real estate financing arena (mortgages, construction loans and A&D loans) will prevent any recovery from accelerating to "normal" levels. Thus, we expwct the "recovery" to be very slow. There are a number of housing factories west of me. I used to see trucks of modular homes, trusses, floor joists, pre-built housing panels every morning. Then for the past two years, almost none. Now I am starting to see more trucks again. I also see more trucks loaded with the small logs that are chipped up and used to make oriented strand board, although these are also used for other products. this is actually a little worrying. lumber has recovered half it's drop and home starts have recovered what, 5-10% of theirs? 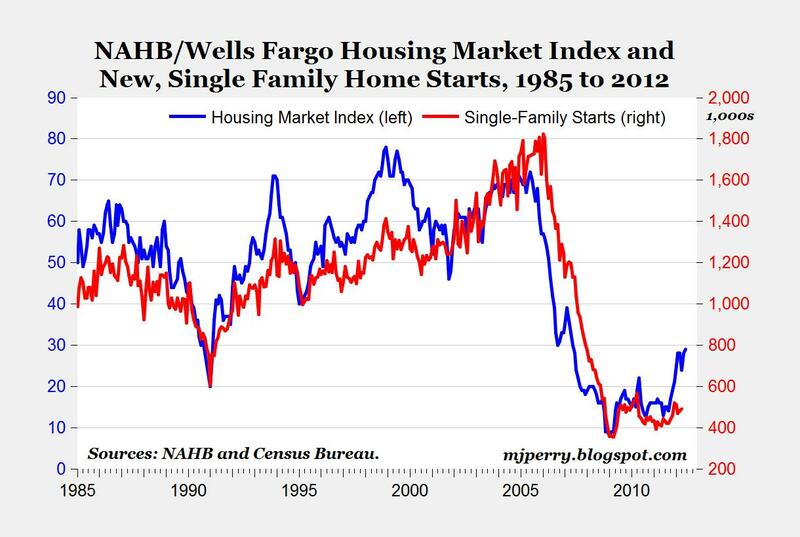 that's a nasty looking trend if housing starts really recover. might be time to buy lumber. Substantial drop in CME lumber futures in the last week or so, from a $280-290 range per 1000 board feet since 5/1 down to about $265 today. CME lumber prices up $6.50 to $273 today as I write this. I show different data at approx. the time of your post (on the CME). Sep 12 is $268, up $6.50 from yesterday's close at $261.50. Light trading volumes. Do you have the confidence to go long? Why do you use 'Unknown'? Is there something we should know? Starts are down, that's at least part of the reason for the substantial drop in CME lumber futures in the last week or so, from a $280-290 range per 1000 board feet since 5/1. Hey Unk, CME lumber down again to $265 basis Sep, down $2.40 on the day. "Substantial drop in CME lumber futures in the last week or so, from a $280-290 range per 1000 board feet since 5/1 down to about $265 today." I've asked 3 times now - Why do you use 'Unknown'? Is there something we should know about what you are? Bart: "I've asked 3 times now - Why do you use 'Unknown'? Is there something we should know about what you are?" Actually it's not really any of our business. I'm not sure scolding will produce a confession. There are many pseudonyms in use on this blog, and I assume people have their reasons. I think it's more important what people write than what they call themselves. When someone consistently posts soon after my posts and virtually always takes the other side, and then doesn't respond to my answers... well, let's just say I'm very suspicious given the amount of times over the last 7 years that I've been attacked, trolled, lied about and to, black PR'ed etc. Yes, it is what they write... and *also* what their intentions are. The "scolding" that I do is more to point out and expose to others that the chances that there's something nefarious and not above board going on is non-zero. And you're free to also believe that everything is peachy keen about him/her. As far as "bart", my nom de plume is an homage to my best friend from my early teens until he died way before his time at age 37 in the 80s. I didn't even realize when I adopted it that many would draw a parallel to Bart Simpson. I use it more to keep my rather hectic personal and web life separated than anything, secondly to keep some privacy.